These little birds, Spice Finches (Lonchura punctulata), look very much the same as sparrows but are even smaller (11cm to the sparrows’ 15cm) and their coloration is somewhat different. 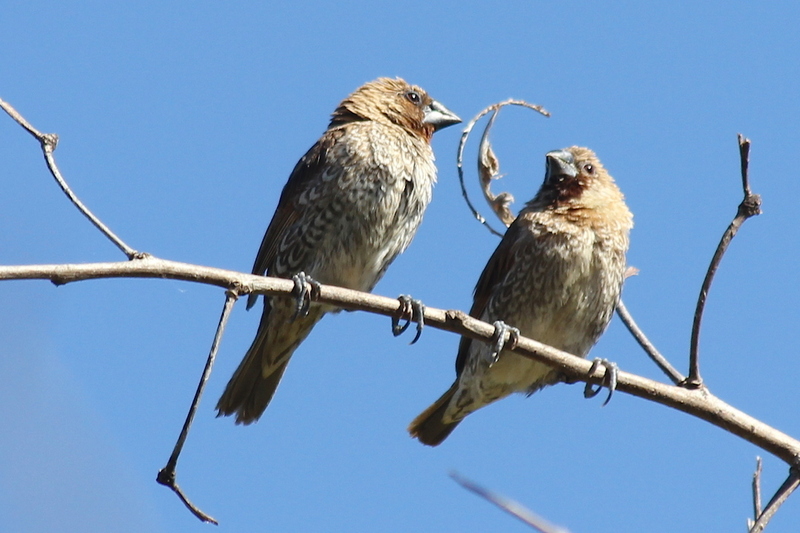 Juveniles are plain brown above and below, while the adults have chestnut faces and a scale-like pattern on the belly feathers. Both are actually exotics which are well established here and both are technically finches – not that we normally think of sparrows as such. 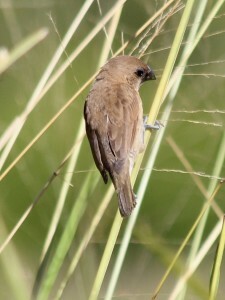 The Spice Finch, also known as the Scaly-breasted Munia or Mannikin (see note on Birdway), is native to tropical Asia, occurring from India and Sri Lanka east to Indonesia and the Philippines. It has been introduced into many other parts of the world and feral populations are established in the USA and Central America as well as here. Slater’s Field Guide says that in Australia it is resident in coastal eastern Australia, mainly from Sydney to SE Queensland “but spreading”. The species seems to be well established around Townsville. On checking older photos in preparation for this post I found that I had photographed them along Ross River on three other occasions and on the Town Common. This small flock was feeding in parkland beside Ross River, Mundingburra, when I spotted them, taking to the long grass and then to a leafless tree when I approached too close for their peace of mind. About this time of year my focus (sorry!) shifts from insects to birds, because there is less insect activity in the cooler, drier weather and more birds in town as they retreat from the gradually drying inland country. This bird, the Leaden Flycatcher (Myiagra rubecula), has been visiting us regularly over the last couple of weeks. 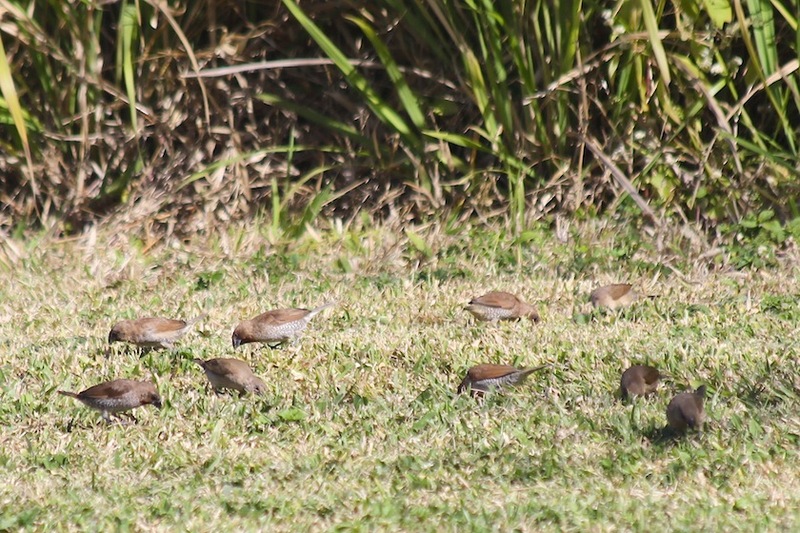 They are resident in our region, not migrants as they are further south, and I see them occasionally in city parklands at any time of year but not usually in my garden. As the name suggests, they hunt small insects on the wing, in the same way that our Rainbow Bee-eaters take slightly larger prey. They also hunt insects in foliage, often quite high in trees, and they are small birds (bigger than Sunbirds but smaller than Yellow Honeyeaters) so they are rather difficult to photograph – the shot above is the best I’ve managed so far, from what must be half a dozen opportunities. Incidentally, I saw a pair of Spotted Turtle-doves in our palm tree this morning – the first time I’ve seen them since last April. 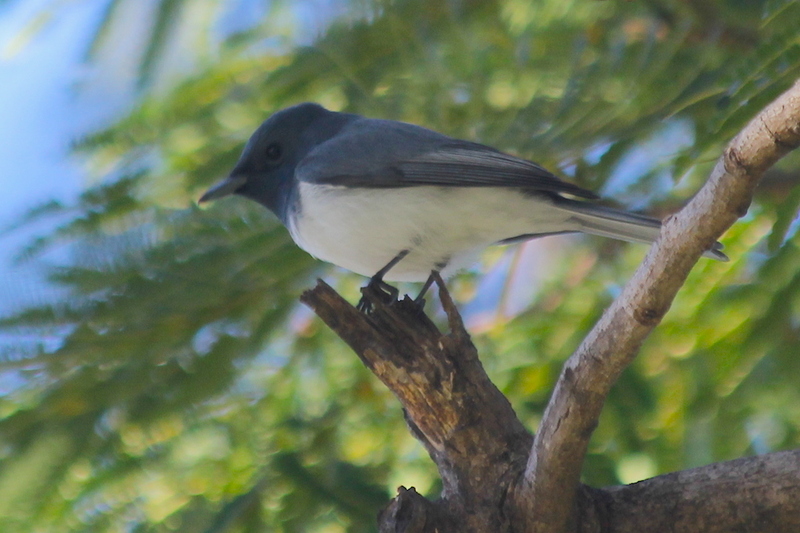 More information on the Leaden Flycatcher: Birds in Backyards. Most Koels migrate from Australia to New Guinea and probably eastern Indonesia and even further north, but some remain in northern Australia. During breeding season, they are found in northern and eastern Australia, south to about Nowra, New South Wales, although occasional birds are encountered further south. … Common Koels are found in tall forests and are common in suburban areas. 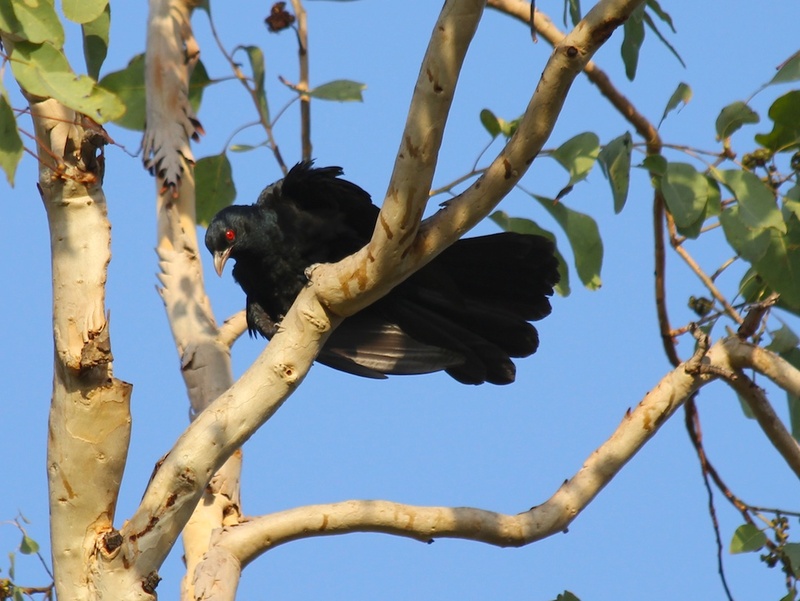 The male Common Koel advertises its presence by a loud ascending whistle or ‘koo-el’, monotonously repeated; the call of the female is a repetitive ‘keek-keek-keek-keek’. Males often call throughout the day and well into the night. Both of them are right on all points I’ve quoted. The Koel in my photo, taken two days ago, is one of the first I’ve seen this season; he’s a male (females are camouflaged in mottled stripes of grey-brown – here is one from a couple of years ago) and he has been calling constantly since he turned up. We sometimes call them Cooee-birds because of their call but they are more widely known as Storm-birds or Rain-birds because they seem to call even more often in the lead-up to rain. The true koels, Eudynamys, are a genus of cuckoos from Asia, Australia and the Pacific. They are large sexually dimorphic [i.e. male and female look different] cuckoos which eat fruits and insects and have loud distinctive calls. They are brood parasites, laying their eggs in the nests of other species. In Australia, their hosts are mainly large honeyeaters (especially Noisy Friarbirds and Red Wattlebirds) [maybe Friarbirds and Blue-faced Honeyeaters too?]. Unlike in other parasitic cuckoos, the young do not attempt to kill the host chicks. This trait is shared with the Channel-billed Cuckoo [see An Unexpected Visitor], which – as in the Pacific Koel – are largely frugivorous as adults. By “current treatment” I mean there is general agreement since 2011 among BirdLife Australia, BirdLife International, the IOC and Clements. So it will remain until someone does some more DNA work and upsets the apple cart again. The irony with all this is that Lynnaeus named it E. orientalis in 1766, so I hope he’s feeling smug. The BirdLife Australia taxonomic list, published in June, shows that the Eastern Koel in Australia belongs to two races, the South-east Eastern Koel (Eudynamys orientalis cyanocephalus) and the Torresian Eastern Koel (Eudynamys orientalis subcyanocephala). The one we get here is the Torresian. So there we are: the handsome, garrulous gentleman in my photo is a Torresian Eastern Koel, Eudynamys orientalis subcyanocephala.